F1 and MotoGP in Spain: My Kind of Speed Date! Most football fans know how HUGE Spanish football is within Spain, but what you might not know is how well attended motor-sport events are. With an unprecedented four MotoGP motorcycle events, a Formula 1 weekend AND winter testing on the Spanish motor-sport calendar, it’s never too long to wait between speed dates! During the late 1980s and twice in the 1990s, Jerez was the venue for the Spanish and European Grand Prix on the F1 calendar. While it may have lost out to Barcelona and later, Valencia for the actual race, the Circuito de Velocidad (speed circuit) in Jerez has continued to be the place where the F1 teams prefer to conduct their winter testing in late January or early February, each year . On the morning of Tuesday 28th January, we had an early start for the three hour drive to Jerez from our home, east of Málaga. With good, quiet roads we made excellent progress and were soon within 20kms of Jerez, enjoying our breakfast of coffee and toast, and still in time for the 9am revving of the engines. The circuit is well used to hosting huge motor-sport events and has a good system in place for funnelling the traffic to the nearby car parks, which cost us just 1 euro to park our car for the day. 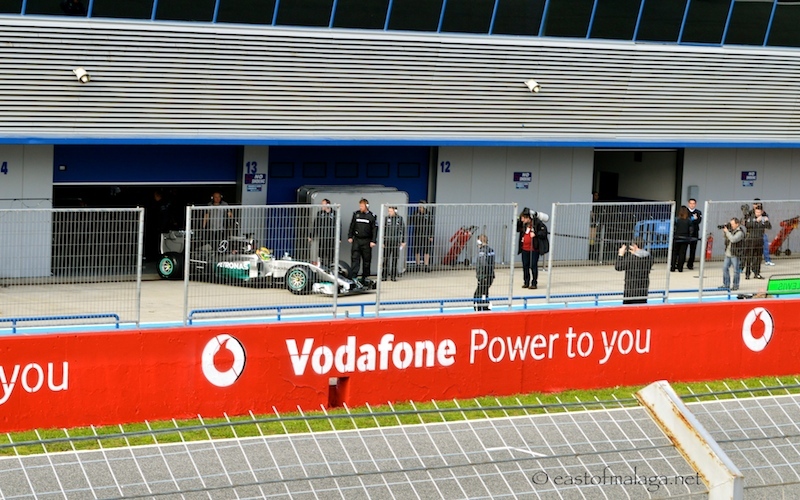 The first time we travelled to Jerez to watch the F1 winter testing was about five or six years ago when only one of the stands was open, the entrance cost for the day was five euros and there were fewer than 200 people there. Things have changed a bit since then, as now there is a choice of entrance to the VIP tribune area for 20 euros per day or general access for 10 euros per day. Seating is not allocated within the circuit, leaving you free to move around as you wish, to try to get the best view. Since we were going to be there for the first two of the four days of testing, we decided to take the VIP tickets for the first day and have general access on the second. That way we got access to approximately half of the circuit over the two days. There are plenty of stalls where you can buy food and drinks or snacks, though you can also do what we did and take a picnic in a cool box. Among all the stalls selling tee-shirts, flags and caps supporting various F1 (and Moto GP) stars, it was sad to see the irony of the “Sale rail” selling off Michael Schumacher tee-shirts for just 5 euros. Our first day was spent on the inner part of the track, starting in the VIP tribune, opposite the team garages in the pit lane. Not all the drivers are at the track at any one time, but over the two days we saw Kimi Raikkonen (Ferrari), Jenson Button (McLaren), Sebastian Vettel (Red Bull), Lewis Hamilton and Nico Rosberg (Mercedes), and Sergio Perez (Force India) amongst others. There were lots of photographers in the pit lane and each time one of the cars fired up, there was a flurry of activity as they jostled to get first sight of the new, updated vehicles with their V6 engines and styling. Just before the lunchtime break, we witnessed Lewis Hamilton’s spectacular front wing failure which resulted in his vehicle skidding for one hundred metres into the gravel trap and tyre barrier on the first corner. Sadly, even though he was unhurt, this was the last we saw of Lewis, as the next day saw the turn of his team-mate, Nico Rosberg. On the second day, we were nearer to the entrance, on the outside of the track, and there was definitely more driving action as the teams had adjusted their expectations after their testing sessions on the first day. Every so often, the track marshalls waved their red flags to suspend the action, and out came the pick-up truck to collect a stricken car which had broken down somewhere on track. The winter testing days provide the first opportunity for the general public to see the styling and design of the new season’s cars and to hear the difference in the engines as their capacity has been reduced from 2.4 litre V8 to 1.6 litre V6 turbo. I’ve been a motor-sport aficionado for as long as I can remember, and have attended quite a few Formula 1 and Moto GP events, but it’s always astonishing to see and hear the speed of the cars at the track, as they are greatly distorted on TV with telephoto lenses and microphones. Bear in mind that these four days are for testing tyre wear, cooling systems, handling and suspension set-up, brakes, reliability and the overall performance of the cars. It is not a race, so there is no guarantee that any particular cars will be on the track. 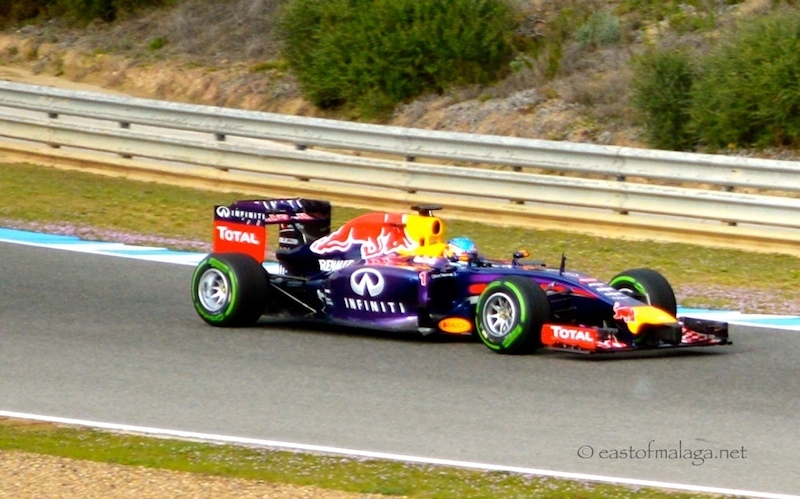 World Champion Sebastian Vettel in the Red Bull, for example, only appeared during the final 20 mins of first day, for two individual laps and completed just two further laps on the second day. I hope you will appreciate the clambering about I had to do to get some of these shots – but it was a good opportunity to put my new Nikon D3200 camera through it’s paces! Although Jerez is no longer one of the venues for the Spanish Formula 1 Grand Prix, the weekend of May 4th 2014 will see approximately 125,000 motorcycle fans descend upon Jerez for the first of four Spanish dates on the Moto GP calendar – the largest crowd of the MotoGP season worldwide. How the Spaniards love their motorcycle racing, and no wonder with so many Spanish riders in the line up. Current World Champion Marc Marquez, who won the crown last year despite being a rookie, is just 20 years old and will have his work cut out this season, with previous World Champion Jorge Lorenzo trying to regain the top spot. If you want to see a lap simulation around the track, click here. If you are a fellow petrol-head and want to travel to visit either the F1 winter testing session or the MotoGP in Jerez, it is definitely worth staying in the city for a few nights to visit the sherry bodegas. You could also visit nearby Cadiz which, at over 3000 years old, is one of the oldest continually-inhabited cities in Europe. 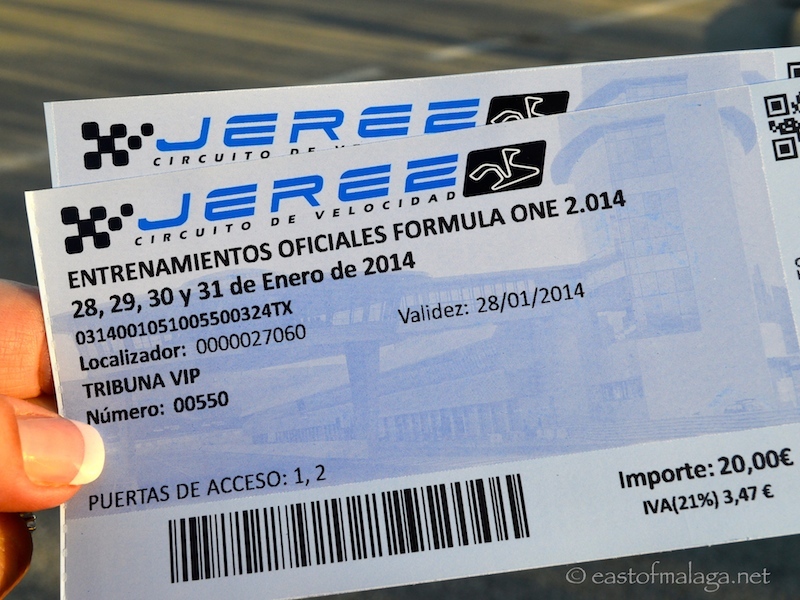 You can purchase TICKETS for the MotoGP in Jerez from the circuit, HERE or for the Formula 1 race in Barcelona, HERE. ARE YOU A SPEED FREAK, LIKE ME – OR DO YOU PREFER TO LIVE AT A MUCH SLOWER PACE OF LIFE? 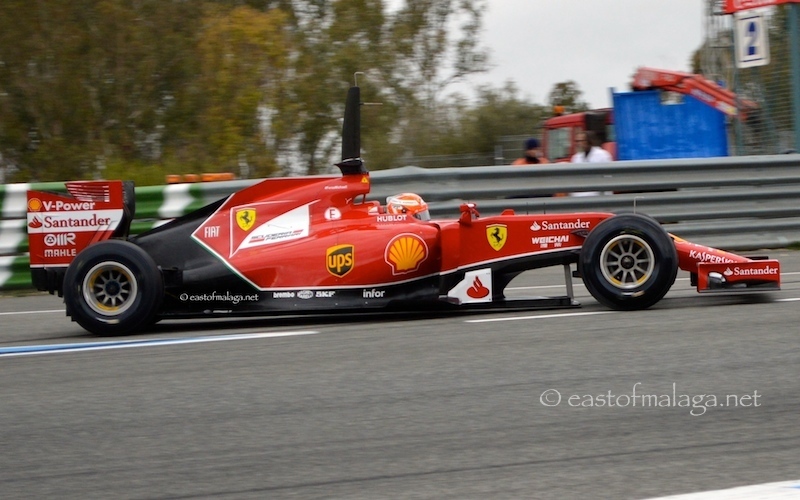 This entry was tagged Andalucía, cars, Europe, F1, Jerez, life, lifestyle, MotoGP, photography, Spain, speed, travel. Bookmark the permalink. Though I’m not much a fan of auto racing — the threat of horrific crashes turns me off — I will admit that few sports are as exciting. If you’re a fan, being able to see them train must be thrilling. You are quite the speed freak Marianne. I used to enjoy it. Now I prefer the slower pace of life. LOL! I like motor racing but don’t enjoy crowds so attending the testing days sounds like a great idea to me. Well well Marianne. I never knew I was friend with a fast woman. Thanks for your visit (and hugs) – always appreciated. Well, I think it’s exciting, Meredith, but I quite understand that motor racing isn’t for everyone. It sounds exciting! Thanks for the post! I am not a petrol head, but the son in law is, and until recently their holidays were planned around the F1 schedule!! Now the children’s holidays take precedence. I would love to witness one someday. Fab post Marianne. I totally understand that schedule – we plan our weekends around the races during the season. Hope you get the chance to attend a race one day, Madhu. It’s really exciting just being a spectator, I can’t imagine how exciting it must be to actually take part! Now there’s a challenge!! Oh, I’m a petrol head…not necessarily a speed freak, as I’ve never had a really fast car..BUT my little old car and I have been round many of the racing circuits in Europe, a couple of hill climbs as well. And I love watching fast cars! I think if ever anyone gets the chance to visit any large event (sporting or otherwise) it’s always a good idea to go – just to soak up the experience. Big Man love the racing and I love Jerez so ee enjoyed this!